Maple Bacon Coffee Beer? Really? That Settles It: There Is A God! | OhGizmo! 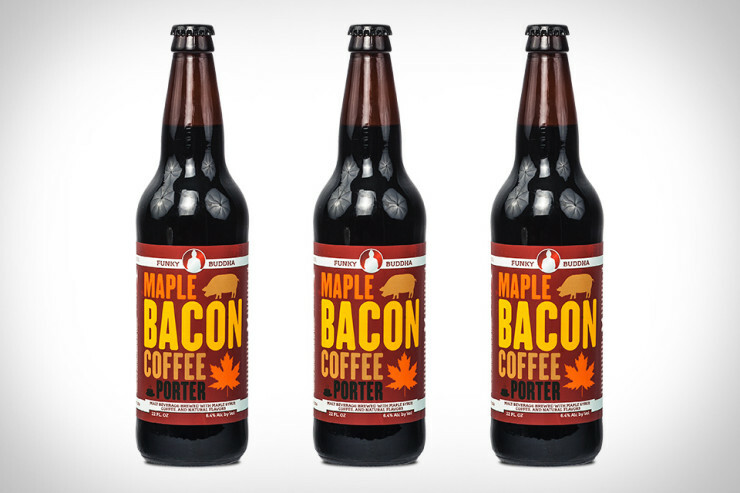 Maple Bacon Coffee Beer? Really? That Settles It: There Is A God! Evoking a complete diner-style breakfast in a glass, Maple Bacon Coffee Porter is a complex beer with a multitude of flavors at play. It pours an opaque ebony brew with a frothy tan head. Aromas of sticky maple syrup, coffee, and cream creep forth from the glass. The mouth feel is luxuriously creamy, with layers of sweet malt, toffee, and roast giving way to waves of smoke, coffee, and salted chocolate. It finishes sticky, rich, and sweet, with the flavor of maple syrup lingering pleasantly on the tongue. It’s a special release brew with 6.4% alcohol content. We’re not sure where it’s available, but the company’s website is solid and should be able to point you in the right direction. Incidentally, you should check these guys out altogether. They have a bunch of other funky flavours, like Raspberry Habanero and Reece Peanut Butter Cup. I’ve tried this at Monk’s in Philadelphia last year, and let me tell you: This might be my favorite beer that I’ve ever had. The maple isn’t cloying, the bacon flavor gives it a nice smokyness, and the coffee comes naturally being a porter. This beer does everything right that Rogue’s maple bacon ale gets wrong. It’s also low enough ABV to be a good session beer. I can’t recommend this beer enough.